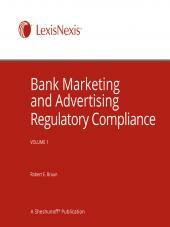 This guide provides analysis for each consumer regulation in its entirety and includes summaries of the effect of that regulation on different functions within a financial institution. 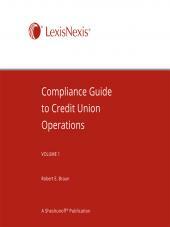 This comprehensive guide address operations, procedures, compliance, disclosures, notices, marketing, advertising, and record retention. Keeping up with all the new and changing consumer regulations can be an overwhelming task for bankers. How can you stay on top of all the rules for deposits, fair lending, real estate lending, consumer credit, leasing, and recordkeeping? 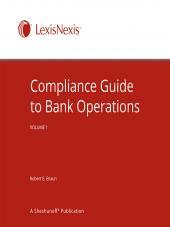 Regulatory Compliance Guide for Bankers analyzes each consumer regulation in its entirety, then summarizes and explains the effect of that regulation on different functions within your bank. It's easy-to-understand format and explanations make it an essential tool for compliance officers and senior managers who need to know about specific regulations in order to establish good procedures and stay in compliance. The guide covers all the deposit rules, including those under Section 19 of the Federal Reserve Act, Electronic Fund Transfer Act, Expedited Funds Availability, Truth in Savings, and the Federal Deposit Insurance Act. The fair lending and real estate section covers the Community Reinvestment, Home Mortgage Disclosure, Equal Credit Opportunity, Fair Housing, Real Estate Settlement Procedures, and National Flood Insurance Acts. In the consumer credit and leasing section of the manual, you get expert analysis and interpretation of the regulations under Truth in Lending (for both open-end and closed-end credit), the Federal Trade Commission Act, Consumer Leasing Act, Fair Credit Reporting Act, and Fair Debt Collection Practices Act. Finally, the manual contains a section on the rules for recordkeeping, under the Bank Secrecy Act and the Right to Financial Privacy Act.